This Spring the garden seems more enjoyable than ever before and so far the best and most beautiful of any in 34 years. It’s almost impossible to attribute any success or failure to any one thing because of all the variables involved. But there are certain major things that you can point to as being responsible for most successes and/or failures. A good healthy soil that allows an active complex community of organisms living in the soil – is top of list in importance. And since I was able to supply an even greater abundance of organic material to my soil this past fall, that has to be part of it. The weather is another main factor in how a garden does. One we can’t control — only accept and work with — but a main factor nonetheless. And this Spring in my opinion has been almost perfect. Yes, we had almost 4 weeks of drought in April — but temperatures were cool. So that — coupled with the fact that rain came just at the critical mark — the garden continued to look and do great. Since then the gentle rains have come often — but not too often. Spring temperatures in Virginia as usual have fluctuated from cold to hot, but the extremes didn’t last long and most of the temperatures were perfect. While I was enjoying all this, a lot of gardeners were saying it was too cold. But it certainly worked for me — giving me time to plant more and find room for more. Upper end of my garden on May 20th. As regular readers know, I’m not set up to start seed inside. (No room and insufficient light.) The wintersown method has been my answer to the problem. The seedlings germinated more quickly, were robust – healthy and lush, grew quickly to ideal size for transplanting, held a month or more until I could get to them, and responded beautifully when placed in the garden. NOTE: Warm weather crops cannot be started in winter. You start them when warm weather crops are usually started you just do it using the winter sown method. About 2 to 4 weeks before it was time to direct sow crops like radishes, beets and Hakuri turnips — I seeded in jugs via the wintersown method. Because of that I enjoyed these crops much earlier than I normally would have had I waited to direct seed only. 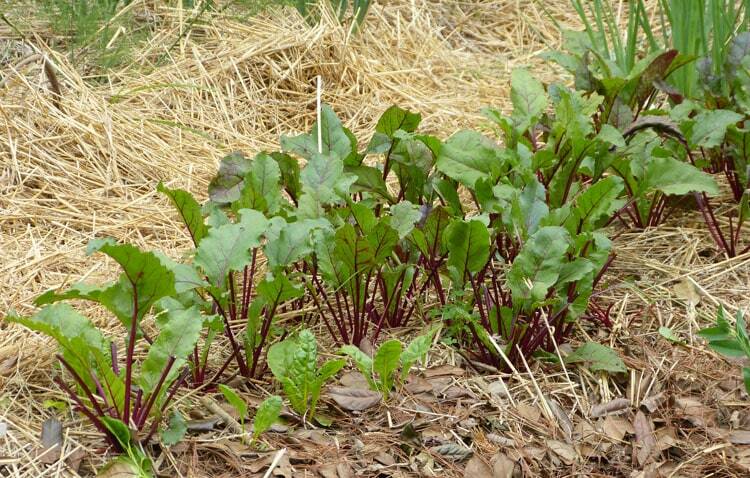 Beets – Winter sown January 4 and transplanted to the garden on January 25. I’ve harvested some and I’ve picked the greens over and over for use in salads. Thanks to winter sown I have lettuce, beets, radishes, turnips, kale, chard, broccoli, cabbage, tomatoes, peppers, and eggplants in various stages of growth — and with very little effort. At least, no more than what I could handle giving it a few minutes of attention each day. And by the way — various stages of growth means that I won’t be overwhelmed with harvest of any one thing. Abundance of beautiful produce in my garden has never been better! Hello! That is so excellent to hear that things are going so well and I love the pics. My scallop squash is looking amazing and everything else is doing just ok. I need to mix up some homemade bug spray since some are getting eaten on. Question – you said you added a greater abundance of organic material in the fall – what did you use? I had more leaves this fall than usual and that’s one of the best things you can use in the garden. Also I was able to buy a few bags of a composted (for 7 years) horse manure called 7 year gold. (They have a website.) I am using that selectively. I used a scoop mixed with the soil before planting most crops. I did NOT feel it necessary to use in bed where potatoes or onions where planned. Wishing you much success in the garden! Theresa, I’m also having a great year so far. I agree with what you say, and most definitely the winter sown method takes the mad rush out of the spring season. Also, it has allowed me to try more new things rather than waiting till I can buy a six pack of seedlings at the store. Now, although it’s a bit early, I’m wondering how I can adapt it for use in the Fall garden. I’m definite starting everything in the fall via the wintersown method. This is the first time in years that I’ve been excited about fall planting, because with the wintersown method I can start in August which is the perfect time. Usually I have to wait until October because of the dry ground and heat. Wintersown will make the timing perfect for amount of light needed to get things going before cold weather and low light set in. YES! I can honestly say that this thought will get me through the next couple of months in the garden. 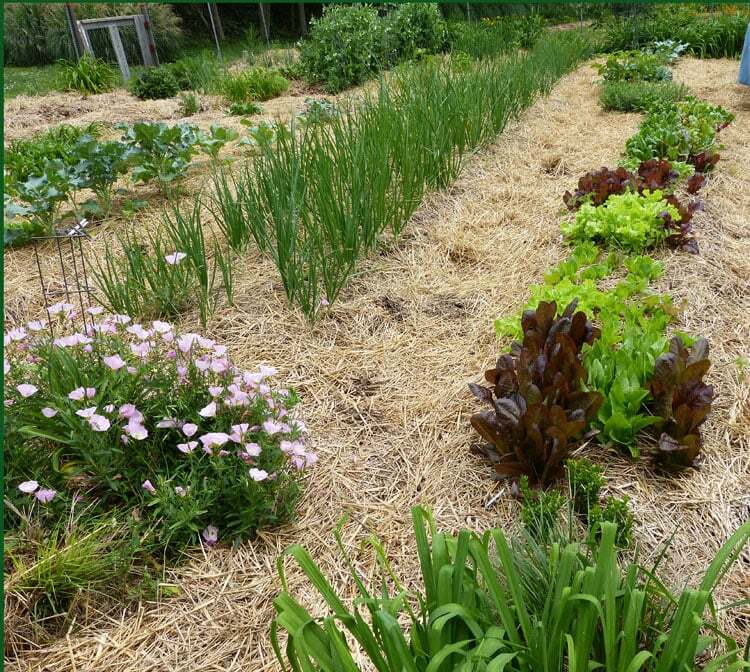 The thought of a Fall garden is my motivation during the summer, and I’m excited about winter sown methods for doing it too. I really hope you will blog your plans and what you are doing, so we can learn from you and each other. I’ll certainly try to keep you updated Sandra. Thanks for asking, because it’s nice to know what’s helpful to you. Just a note on my experience with winter sowing. The very first time I winter-sowed I sowed the tomato seed in plastic milk jugs & stuck them out on the back deck in Dec & forgot about them. When the temperatures stayed consistently right, the seed germinated. When I had time, I planted the seedlings in my garden & they were BEAUTIFUL tomato plants! I harvested 1 tomato that ripened a little early, came home from grocery shopping one day & the neighbor’s donkeys had eaten every tomato AND tomato plant! That is why my I have my garden fenced in now! Thanks for the beautiful pictures. I don’t know how I missed this post until now. I’m sure glad I found it tonight.